Subcompact crossovers continue to increase in popularity, and not just on North American roads. Take the Ford EcoSport. It has been built and marketed overseas since 2003 in places as far-flung as Brazil, India, Thailand and Romania, and sold in many more markets. Ford finally started to bring Indian-manufactured models to its home market in 2017. You need to look at the EcoSport when it’s in a parallel parking spot with clearly marked lines to understand how short and narrow it is. 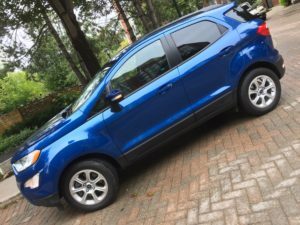 This mix of an economy car’s size with an SUV’s elevated body isn’t unique to the EcoSport, but it is a little incongruous. Nevertheless, the popularity of similarly shaped vehicles justifies the existence of this segment. A wheels-at-the-corners stance (particularly at the back) suggests sporty handling. The black liner that rings the base of the Lightning Blue body on my tester ought to keep stone chips (and rust) from marring the body. Simple lines front to back make the give the EcoSport an honestly economical look. The exterior’s impression of practicality extends to the durable materials that surround occupants, from the firm seats to the plastic on the doors. 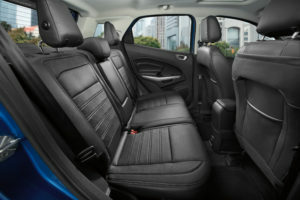 That practicality makes itself apparent in numerous useful touches throughout the cabin. 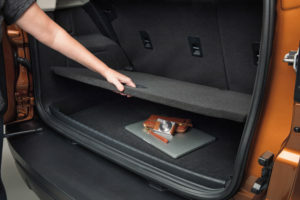 For example, ambient lighting outlines things people may want to find in the dark, like the two USB ports up front, door handles and cup holders. The rear seat is tight for my 6’5” frame, but it does feature USB ports for rear-seat occupants. 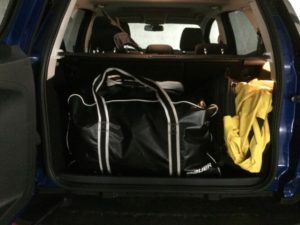 The bag fits comfortably in the rear with just enough room for a computer backpack beside it. Opening the back was a head-scratcher. I had to have it pointed out to me that the door swings to the side, not up, from a handle on the right side of the door. It’s in the electronics that even economy vehicles can excel, and Ford shows how it’s done. 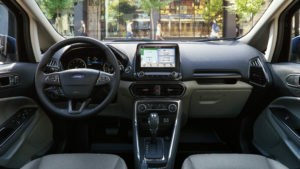 Ford’s SYNC-driven touchschreen-based system has evolved over the past five years to become one of the more user-friendly on the market. With few exceptions, all on-screen controls are easily visible because they’re large. They are also easy to touch, even on bumpy roads, again because of their size. And Ford has always known to keep certain timeless, intuitive physical controls, like volume and tuning knobs, instead of going for an all-touchscreen interface. Use physical controls like the volume knob, fan speed dial or temperature dial and the screen automatically shows, again in a large dial, the setting you’re changing and its current value. The system also effectively handles audio, though I stuck to using Apple CarPlay during my time with the EcoSport. Other available features include Android Auto, satellite radio and the ability to turn the EcoSport into a WiFi hotspot. The instrument cluster features one screen between the tachometer and speedometer. Controls under the left thumb make navigating the car’s settings straightforward. I suspect the default screen for most drivers will be the one that shows four different pieces of information, including overall and instant fuel economy. Ford’s EcoBoost technology results in what would have been unthinkable not so long ago – a standard 1.0L turbocharged, direct injection engine. A 2.0L engine is also available, but the 1.0L is surprisingly capable. Using EcoBoost technology, Ford claims these engines are 30% more fuel efficent and exhale 15% fewer harmful emissions. Power transfers via a six-speed automatic transmission. Ford claims 8.6 L/100 km city and 8.1 on the highway. Combined, the EcoSport’s fuel economy monitor told me I managed to bring the number down to 7.4. That’s thanks in no small part to the engine start/stop technology. This has long been a staple on hybrid cars, and it’s heartening to see automakers bring it to internal combustion engine-driven vehicles too.